For many users, a simple turnkey laser system is optimal so that you can concentrate on your experiment and not the laser itself. Having a diode laser with very high beam quality, narrow linewidth and high stability is what one expects of any laser system. Our Lepton IV Series of diode lasers provides an affordable alternative to more costly gas or solid state lasers. All you do is plug it in and turn it on. No additional heat sinks or power supplies are required. Output is adjustable from zero to full output power. For the narrow line lasers, the temperature can be adjusted to move the wavelength. All safety features are incorporated for a fully certified system. 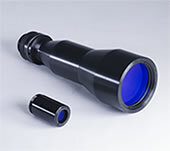 Accessories include beam expanders, focusing optics, filters, polarizers, beam splitters, etc. Adapter plates and rings are available to mount the laser with common optical mounts found in any lab. OEM versions of these lasers are available with full control of all laser parameters. 90-125 VAC, 190-250 VAC, 47-63 Hz. *Laser with a ( * ) operate with a single longitudinal mode. Other wavelengths and power levels available on a semi-custom basis. We have specialty diode lasers that are used in certain applications. 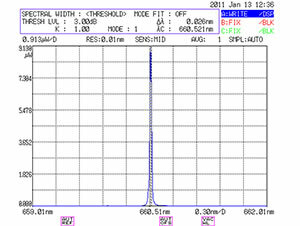 Lasers for Raman are used in medium to low resolution Raman applications. Grating Stabilized Lasers are used in Raman or interferometry. Focused Spot Lasers are used in particle analysis, cytometry and sensing.